Green Topics - How to Go Green: Protection in All Shapes and Sizes - Pour-Your-Own Mulch! Protection in All Shapes and Sizes - Pour-Your-Own Mulch! Bonded pour in place rubber mulch of recycled tire tread is a solution to many landscaping challenges for homeowners, commercial landscapers municipalities for parks and medians. Bonded pour in place mulch is also perfect for the landscaper doing municipal jobs that have signature trees in parks or public venues such as arenas, stadiums, or school campuses. 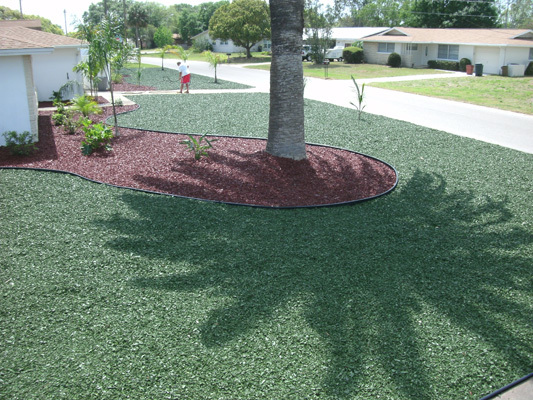 Pour-in-place mulch is environmentally safe, durable and easy to install! The recycled rubber mulch is comfortable enough for paving hiking paths, but solid enough to use as a wheelchair ramp. For those looking for landscaping mulch, recycled rubber mulch is perfect for protecting your trees and garden. The durable rubber protects against insects and landscaping equipment, while being porous enough to let water and important nutrients seep into roots. Now, even if you have large trees, or an intricately shaped garden, you can still give your plants the best in protection with pour-in-place! wanted that wasn't available and what was to easy to find but wasn't wanted. up to snuff, or they can see if they can do some or all of the work themselves. Aquarium plants are possibly the best way to add elegance and beauty to any house or office environment.